Once the grain has reached the 168F mash-out temperature it's time to sparge. Sparging is the action of rinsing the sugars from the grain. The resultant liquid is called 'sweet wort'. (It technically does not become wort until it is boiled with hops or other bittering ingredients to offset the sweetness). 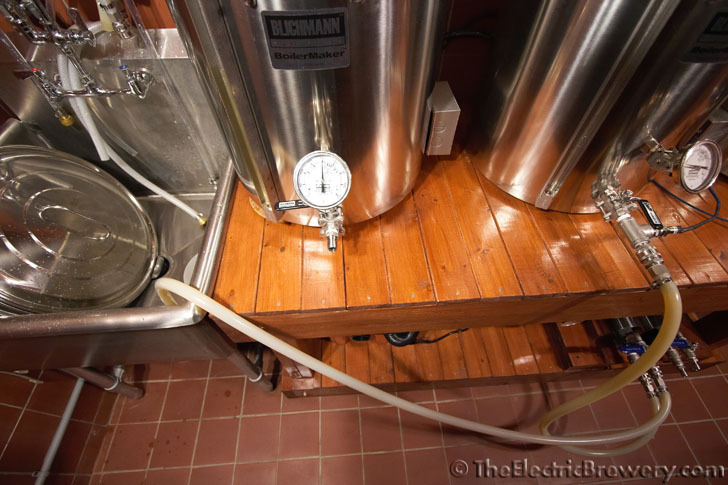 Our Electric Brewery setup boils water off at a rate of 1.9 gallons/hour and we we want to end up with 12 gallons after a 1.5 hour boil. This means we must collect 12 + (1.5 * 1.9) = 14.9 gallons of wort in the Boil Kettle. 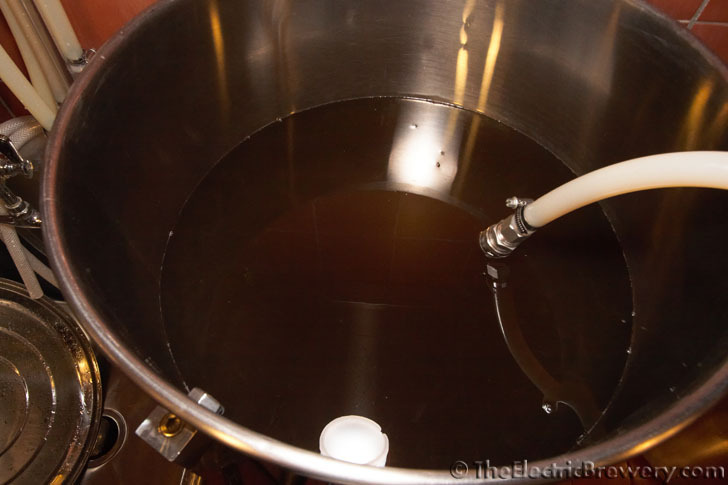 (A 60 minute boil would require us collecting 13.9 gallons, a 120 minute boil 15.8 gallons). The amount of sparge water is not something we normally need to calculate however when sparging continuously as we do (called 'fly sparging'). We always fill the Hot Liquor Tank with twice as much water as finished beer we wish to produce and then simply sparge until the Boil Kettle reaches our pre-boil volume. Simple! Turn the ELEMENT SELECT switch OFF. Turn the WATER PUMP and WORT PUMP switches OFF. CLOSE all valves. Connect hoses as shown in the picture below. The longer 6 foot hose directing wort into the Boil Kettle is simply placed over the side so that we can see the flow rate and to make it easier to take samples for pH and gravity measurements. (The hose end is heavy, there is no danger of the hose falling out of the kettle). OPEN all Mash/Lauter Tun and Hot Liquor Tank valves. Turn the WATER PUMP and WORT PUMP switches ON. Slowly OPEN the Wort Pump valve to produce a slow trickle of wort into the Boil Kettle at a rate of approximately 1 gallon every 5 minutes (a slow rate helps maximize sugar extraction). OPEN the Water Pump valve the same amount to match the rate and provide a source of sparge water to the top of the grain bed. Until the Hot Liquor Tank is empty, try and keep a minimum of 1-2 inches of water on top of the grain bed. 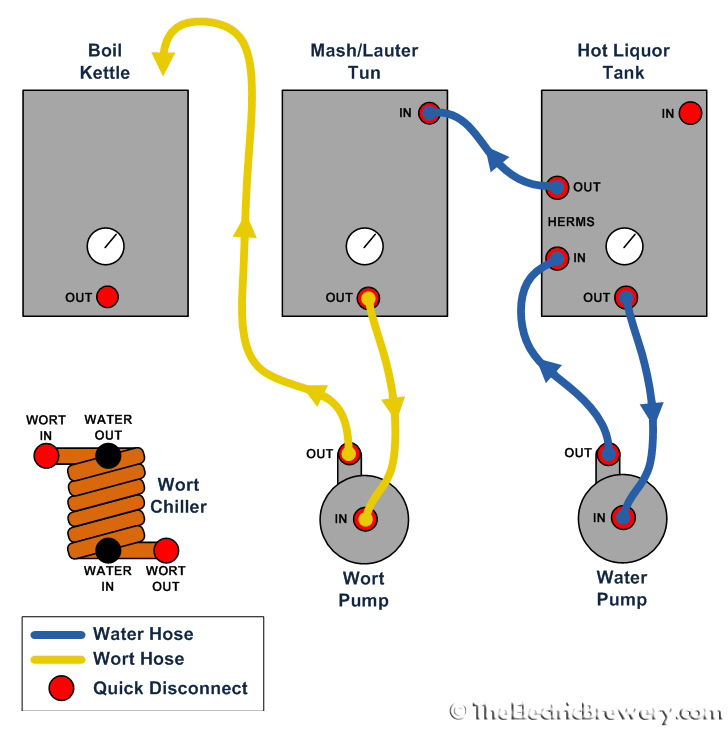 Turn the WATER PUMP switch OFF once the Hot Liquor Tank is empty. Continue to collect wort in the Boil Kettle until a volume of 14.9 gallons is reached. 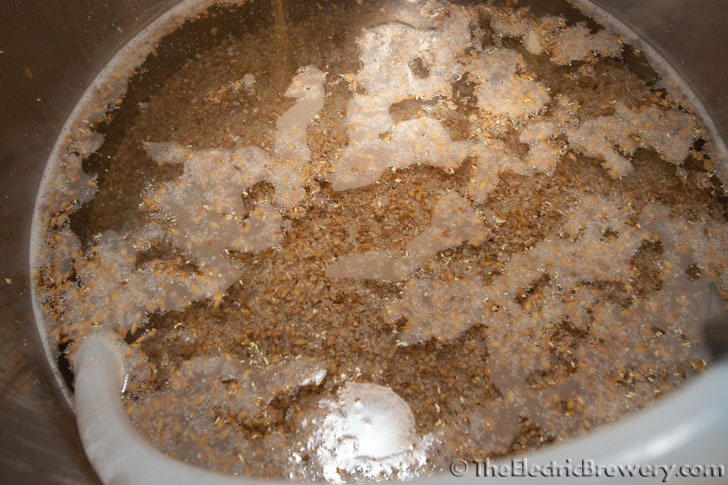 Discard any additional wort. 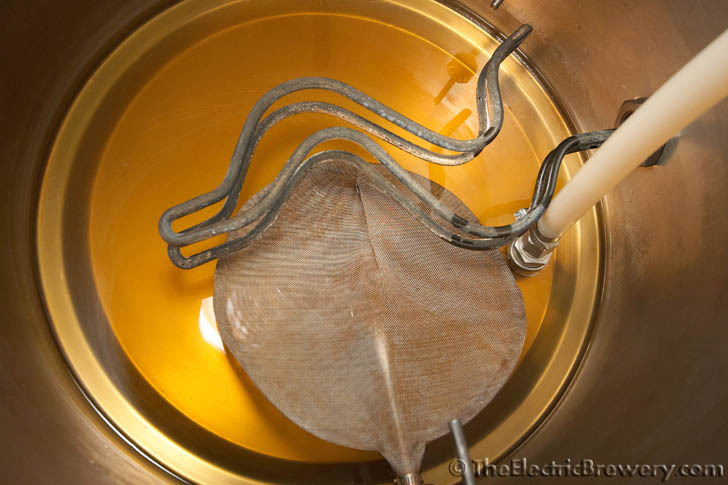 During the sparge keep the Mash/Lauter Tun and Hot Liquor tank lids on to minimize heat loss. The Boil Kettle lid may be left either on or off. 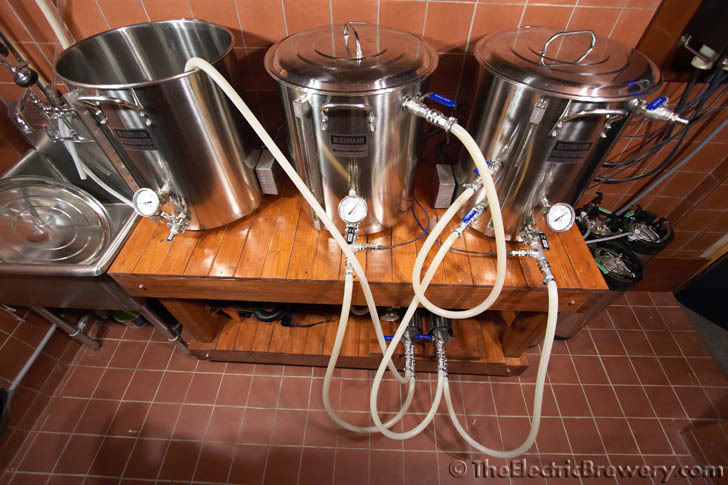 If brewing indoors you may want to run your hood fan at low speed to exhaust any excess heat and moisture. 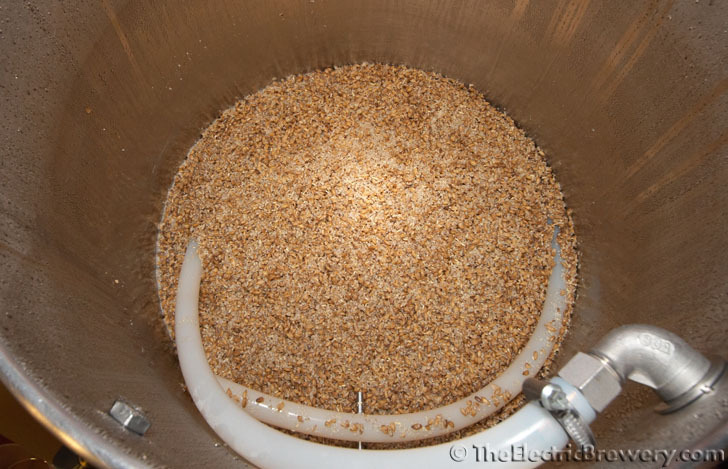 The sparge water is passed through the HERMS coil before being deposited on top of the grain in the Mash/Lauter Tun. This is done for two reasons: To make sure we get the close to 1/2 gallon of concentrated wort out of the HERMS coil and to clean the inside of the coil. 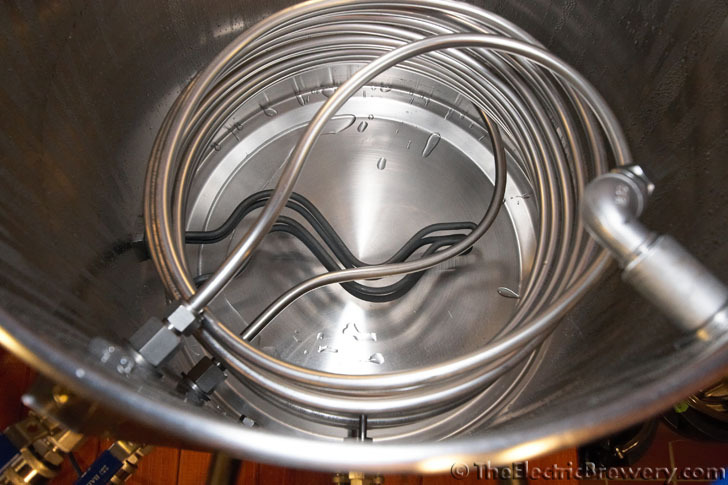 After we've done sparging, there's no need to clean the HERMS coil as it has been thoroughly rinsed with hot water. The sparge water starts at 168F and slowly cools throughout the 60-90 minute sparging process since we turned off the Hot Liquor Tank element. By the end of the sparge the mash will be about 20 degrees cooler. This is intentional. A lower temperature near the end of the sparge helps minimize tannin extraction from the grain husks when it is most likely to occur (the mash has less sugar and higher pH). By the end of sparging the mash has very little sugar left so the drop in heat does not affect the flow. Try and keep at least an inch or two of water on top of grain bed during sparing, though more is fine. 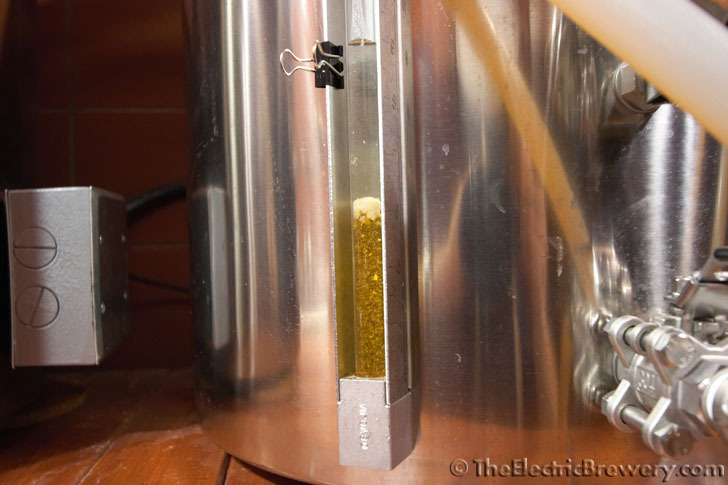 The extra weight will not cause stuck sparge issues with the efficient Blichmann false bottom. A handy trick to match pump rates: Use a black binder clip as shown above to mark the water level and watch it for the first few minutes of sparging. If the water level moves up or down over these few minutes, adjust the Water Pump valve slightly to compensate. It takes us about 5 minutes to match rates at the beginning of the sparge. By not using an automatically regulated sparging system (such as the Blichmann 'Auto Sparge') there is no chance of clogs and less parts to clean. 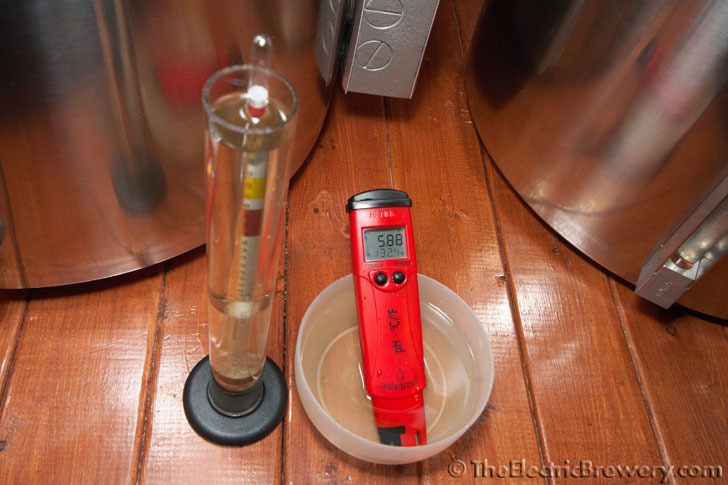 pH and gravity readings may be taken near the end of the sparge. 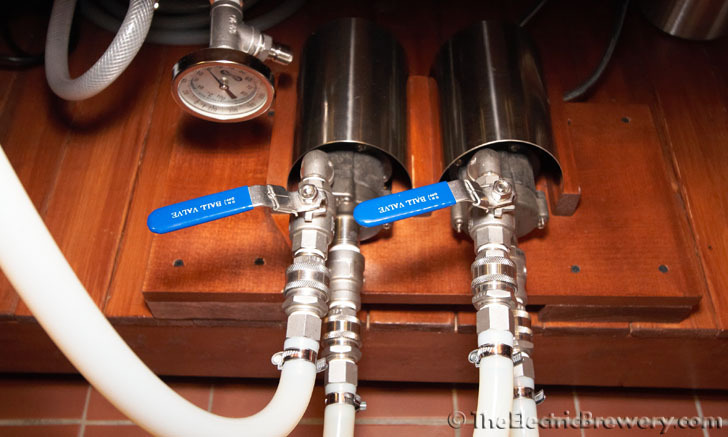 The pH should remain below 6 (when measured at mash temperature) and gravity above 1.008 to avoid excess tannin extraction, though this is seldom an issue given that we've allowed the sparge water temperature to drop naturally during the 60-90 minute sparge. Previously we mentioned the importance of sampling the wort at various brewing steps. Sparging is a great time to do this to better understand how the wort changes from being initially thick and sugary to being mostly water with a slightly grainy/tannic taste near the end.